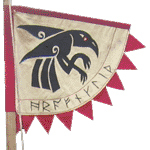 Hrafnslith ('Troop of the Raven') is a regional group belonging to the oldest re-enactment society "The Vikings". We are based in (Wessex) Dorset but have members from as far as Cornwall and Surrey. 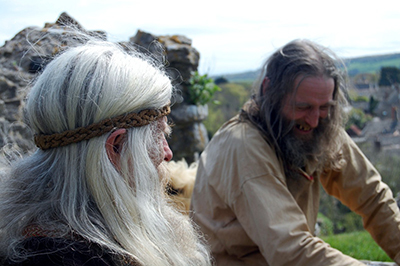 We re-create the lifestyles of the Viking and Anglo-Saxon peoples of the 8th-11th Century. Hrafnslith was formed in 2002 & has achieved a high level of authenticity & knowledge of our period. We are a herred group within the society & Thurstan sits on Hrothgar's Gilthorsson (Konungr = King) High Council. Our group has an impressive living history encampment, with numerous authentic period tents, where we demonstrate a variety of Saxon/Viking Age crafts, skills, games and pastimes. Since the period we re-create was not always peaceful, we also provide combat displays, where our warriors fight equipped with a variety of weaponry. Hravnslith members are approachable and friendly, we enjoy talking to people, answering their questions and sharing our knowledge of the Viking Age with them. We always welcome new members and are a "family friendly" society. Membership information can be found elsewhere on this website and please note that we are available for events throughout Dorset & the UK. Please see our Bookings page for more details. The evening after an unnamed battle near Portchester in the year MMI, an odd assortment of warriors sat at the campfire to pick over the bones of the day. Saxon, Dane, Rus-Vike, Angle and others unknown, talked of a common interest... fighting. All had fought together at points during the day and all had found joy in the shield wall. Some there held no allegiance to any Ealdorman or Jarl, others were unhappy in their allegiances. Grievances and complaints were aired and shared as was the ale and mead.